I first discovered the peculiar subcategory of chopped raw vegetables called “health salads” some 14 years ago when a friend introduced me to the many wonders of the prepared foods aisle at Zabar’s. Even then, I found the idea of one type of salad being labeled “healthy” while my other favorite in the same refrigerator case, the Mediterranean Pepper Salad with Feta and Olives was, I don’t know, something akin to a heart attack on a cracker, somewhat eye-rolling but I now realize that it was the coleslaw-like salad’s mayo-free dressing that designated it such a lofty nutritional status. Regardless, ever stubborn, I did not eat it because it lacked much-maligned mayo, because it was chock full of folate-rich cabbage or because it was branded wholesome, but because I liked it. Crunchy, bright, as good on day 2 as it is on day 7, it was the perfect light meal or side to a sandwich and even though I lived nowhere near the store and found shopping at Zabar’s, even on the slowest day, to be a shopping-cart-rammed-into-the-back-of-my-heels level of annoying (though, really, I should know better than to pause between locals and their smoked fish counter), I was a loyal customer for life so long as they could keep providing me my lightly pickled cabbage fix. Plus, this was in my ovens-are-for-sweater-storage phase of my New York life. Why would I try to make it for myself when someone else was perfectly willing to do it for me? Flash forward seven years and a couple careers, I wrote an article for NPR in 2007 about coleslaw in which I reversed engineered my Zabar’s favorite. In the seven years since, I all but forgot about it until a cabbage salad from Russ & Daughter’s two weeks ago brought it all back. Because I’m obsessed with timing, part of me thinks this would be a better fit for January, when fat-free, vegetable-rich austerity measures are the order of the month. But the thing is, what with all of these vegetables still going strong at local Greenmarkets, it’s seasonal right now. Plus, do you know what’s coming in the next few weeks? Butter and cream-drenched vegetables. Stuffing. Gravy. Biscuits. Every pie, ever and if you’re lucky, a pumpkin cheesecake too. You’re going to need a lifeboat, something you can have on hand in your fridge to break up the calorie stampede. I vote for this. Thanksgiving and beyond on Pinterest! Did you know that you can follow the Smitten Kitchen on Pinterest, and that I’ve been getting the page ready for holiday cooking with new boards with Everything Pumpkin (it’s the most wonderful tiiiiime of the year! ), Thanksgiving: Savory (gobble, gobble), Thanksgiving: Sweet (mm, pie), Homemade Food Gifts, plus All The Cookies in the archives, because I promise, there’s nothing wrong with you that two cookies can’t fix. Hope that helps get your November kitchen engines going. My primary change to this from my last version, and from the versions I’ve had from delis, was the addition of celery seed. I added it on a whim, and we cannot get enough of the flavor. Just a little permeates the pickle mixture with a hint of celery, without actually using celery, which can get a little beige after pickling. This is a flexible recipe, however. You could add actual celery slices if you wish, red onion or a little red cabbage to create the ink pinky tangled look of the Russ and Daughter’s version (which has only a pinch of carrot and pepper strips in it, and no cucumber). The carrots, cucumbers and peppers I use here are modeled after the Zabar’s version. Mix brine ingredients in the bottom of a medium bowl and set aside. Prepare your vegetables: Trim and core cabbage and slice thinly with a knife, food processor slicing blade or adjustable-blade slicer. Place in a large bowl. Core, seed and thinly slice red pepper; peel and thinly slice or julienne carrot; thinly slice cucumber (I quartered mine first). Add vegetables to cabbage bowl. By the time you’re done preparing your vegetables, the sugar and salt should in the pickling mixture should have dissolved. If not, whisk a few times until they do. Taste and adjust if you’d like it a little saltier — I added 1 more teaspoon of kosher salt in the end. 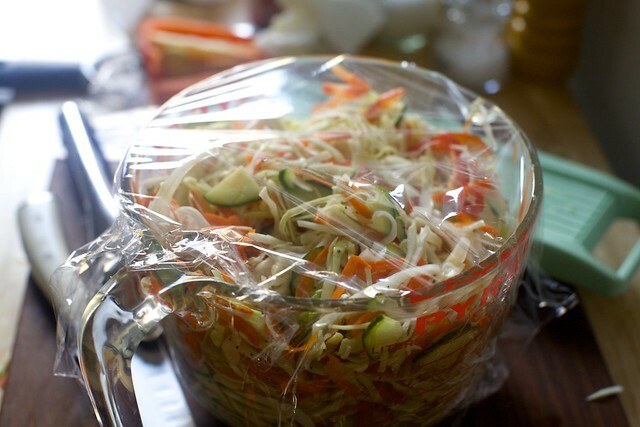 Pour pickling brine over vegetables and cover bowl with a lid or plastic wrap. Refrigerate for 1 hour or up to 1 week. Salad becomes more pickled as it rests. Eat with everything. * Not all salts are weighted equally: Read more here. I used Morton brand, which for 1 tablespoon plus 2 teaspoons clocks in at 24 grams. If using table or fine sea salt, use only 4 teaspoons. Am I making up that they serve health salad when you sit down at the 2nd Avenue Deli? It’s been a million years — even longer than your 2007 article for NPR — but I feel like that was standard. I know they’re no longer on the LES, but maybe it’s still closer than Zabar’s on the UWS? Of course, if you’re already close to Russ and Daugther’s you might as well go there and pick up some candied pecans while you’re out. yum! btw, this is known as “csalamádé” in Hungary, and it’s served as a side to all kinds of sauce-laden dishes or fatty meats. 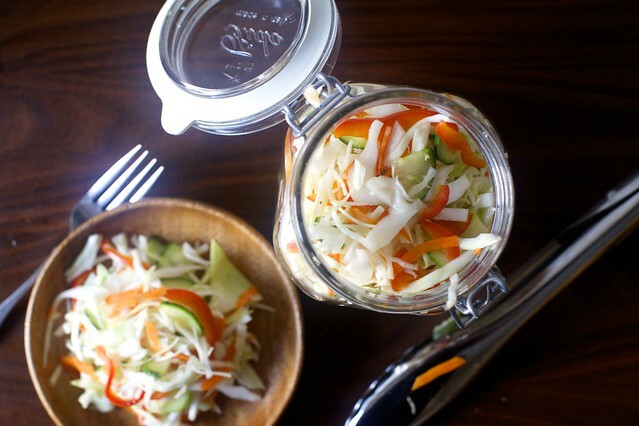 Where did you get those awesome glass containers for the Slaw? This sounds awesome! I only have celery flakes and celery salt at home. Will these work as a substitute for celery seed? Looks so colorful and yummy. Doesn’t hurt to have something healthy at the beginning of the season of rich foods (Thanksgiving, et al.). Thanks for the great recipe! The Pennsylvania Dutch (where I was born & raised) have been making pickle cabbage for a long time. I agree, it’s a nice change from rich, creamy dressings. It’s a favorite side to ham, part of the 7 sweets & sours. I shred my cabbage a bit finer & use celery in place of the cucumber. It’s nice to see another version of it…can’t wait to try it! Do you have to use sugar to brine it? Or can you make without the sugar? I don’t know where you live Ashley, but I know you can get jars like those at IKEA, among many other places. This is very close to the Curtido or Cortido I’ve started keeping in my fridge for 2-3 weeks at a time. It’s an absolutely vital addition to fish tacos, but yes – that vinegary cabbagey crunchy thing is so good for balancing anything rich or heavy. This sounds wonderful! I love making things I try when eating out at home. It’s such a fun challenge to replicate flavors and make it better. I also add some granulated garlic to the brine. Yummy. 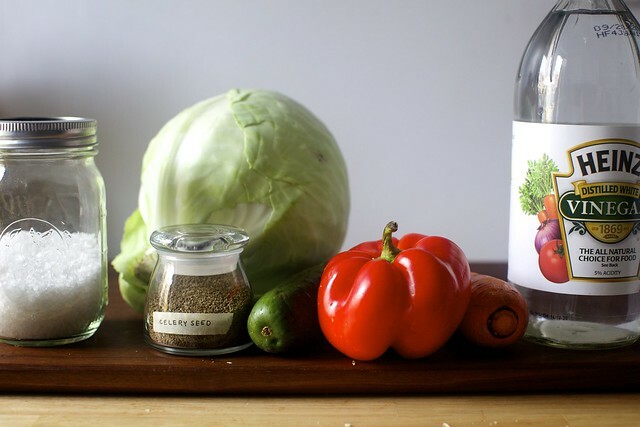 I was trying to remember what this recipe reminded me of, and I finally figured it out…it’s the vinegar slaw from your book with celery seeds instead of dill! (okay, and some additional vegetables). You can never have too many recipes for pickley cabbage salads. I never have pickled cabbage, but this is telling me that I need to try! What do you think about using different vinegar? I almost exclusively use unfiltered apple cider vinegar…I think the acidity is slightly lower. Would it still work? I make a similar one called curtido. Sub the spices with oregano and a pinch of cumin. Replace cucumber with a whole jalepeno cut up in big chunks. After a week, its SPICY! Great with grilled chops or some salvadorian pupusa! looks lovely! i second another commenter above – can celery salt be used instead? what would that substitute look like? grazie! Thank you for this! This will off-set a rich Thanksgiving leftover sandwich perfect, I think! How long will this last once pickled? SuzyG — It should last a week, if not more. I’ve kept them two weeks, even. Celery salt — Is usually just celery seed + salt. I’m not sure what the proportions are, but if they’re half-half, or look that way, I might use 1 teaspoon of it here and reduce the salt by 1/2 to 1 teaspoon (because celery salt is very fine, if I remember correctly), if you’re nervous about it throwing off the salt. Celery flakes — I’ve never bought or tried this before, but it sounds like it’s from dehydrated leaves and stalks. It should probably work, although I imagine the flavor would be a little different and they would ultimately get a little soft. Apple cider vinegar — Can be used. It is milder and a bit more sweet. It’s also a little beige, so the colors will be less crisp. Curtido — I had literally never heard of this before 15 minutes ago and I can’t get over how close it is! My photos look almost exactly the same. Obviously, I must seek some out and make it my new favorite thing, too. Thanks for the tip. ZK — That sounds amazing too. I will take down my Hungarian cookbook and learn more shortly. holly — The salad’s pickle brine has sugar in it, so it wouldn’t taste the way I was aiming for without it. You’d also want to cut back the salt if cutting back the sugar, perhaps even completely since there’s more sugar than salt. Molly — I think they might. I’ve, actually, shh, never been to the new one and it’s been so many years since I went to the old one (which I live a sneeze from). Will fix that this winter. I make something like this with rice wine vinegar and a chunk of konbu. And by “make”, I mean “used to make all the time and will probably go home and make tonight”. i love the term “health salads” :) would love to see what the category of “non-health salads” looks like. Sarah — Probably this grilled bacon salad. But wait, it has no gluten so maybe it’s healthy? My Cambodian mother made a very similar pickle to this all the time when growing up. We usually at it with bbq’ed meat and rice; it helped cut the greasy rich flavor of the meat. Now, I always feel like something is missing if it’s not included in a bbq. Similar also to Haitian “Pikliz”.. except pikliz includes about 6 scotch bonnet peppers! I love that you’re doing “on the other side of the world”! I’ve gotten well out of the food blogging world and shut down Sasasunakku completely (busy with writing a thesis and back among my peeps I feel less of an urge to be online) but I always read your posts and it’s nice to know I don’t have to bookmark everything for six months in advance! Thank you. I can taste it from here. Dat sweet, sweet pickled crunch. .. I looove pickles and this cabbage looks crispy and delicious! Looks delish. We are pickle fiends in this house. We literally have an entire pickle shelf in our fridge. Also cranberry orange buns are the bomb and they ended up being Christmas morning breakfast! Can’t wait for them again this year! 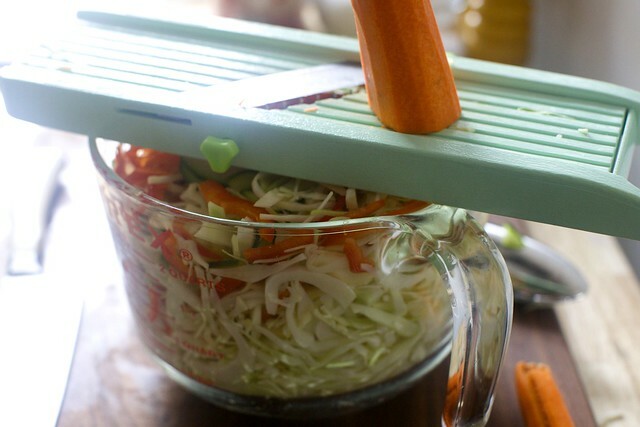 This has been the only way I’ve made slaw for the last 10 years…. I think it’s so much yummier than the traditional method with mayo, probably because I’m a huge fan of vinegar. This resembles the slaw they give you in Salvadorean restaurants to eat with pupusas! This looks great!! Have you tried cutting back the salt in any of your brines? Normally I don’t want to mess with your recipes, but I really, really like pickled veggies so I’m a bit worried I’m eating too much salt. Would I cut back on the sugar/salt evenly? Any thoughts? Deb, does the cucumber have to be kirby? Or could I use a seedless cucumber that I can find more easily? Coleen — You can use any kind you can find. If you can find Kirbys, I do like them best here. The cranberry orange breakfast buns are the best ever! There are a ton of cinnamon bun recipes out there – strange doughs and even stranger fillings – but your cranberry orange buns are just about perfect. They are a new fall tradition. I’m all up for Mayo-free anything! 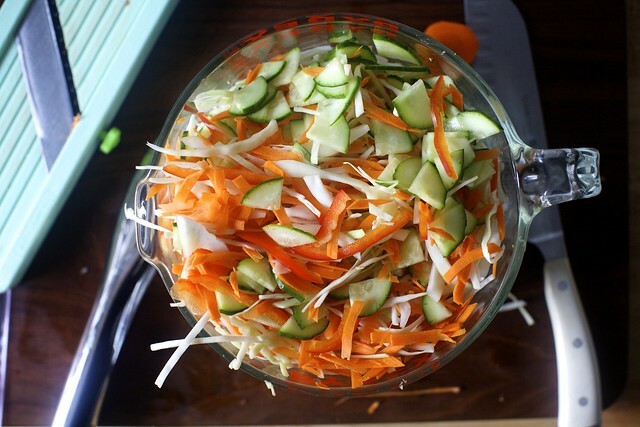 My family makes a slaw similar to this, and although it sounds strange, it is delicious with broken up ramen noodles on top (uncooked and unflavored). Would kale hold up in this salad if I threw some in as an extra punch of health? Cammie — I have never tried to pickle kale but I imagine it might wilt instead of crisp up, at least the flat kale. Do let me know how it goes if you try it; I’m curious! What a beautiful and colorful salad! So simple. Marking to try later. I love this recipe because I happen to live in an area (Buffalo, NY) where cabbage is a big, big deal. Everyone eats cabbage here! The famous food trucks use it in lieu of salad on their taco’s. And like you said, so healthy, love that too. Great recipe. That looks delicious and so healthy! I think I might have to try that one out. I’m not usually a cabbage fan but that looks super tasty! Do you think it would be OK to use savoy cabbage instead of regular in this recipe? Thanks! Yum.. nostalgic for the old take away spots Zabars and so many lovely delis. Love all the cross-cultural recipe notes flying through the comments! I like to add juniper berries…they’ve become my favorite addition. Your photos are stunning, yet it’s such a simple pickled salad to make. You just inspired me to make some for the next family dinner. Thanks for sharing, Deb! Thank you, thank you, thank you for adding the .5 for the antipodes! I always save recipes for when it comes around to Summer and we can gorge on summer fruit but never go back to them. You’re a wonderful person! Don’t we have to boil the brine first? Can one add shaved Brussels sprouts to this mix too? What about some garlic and dill? Some tall romaine leaves? And maybe some walnuts? Thanks for sharing this MOST delightful and delicious-looking recipe. I cannot wait to try this. My husband often craves crunch- being a vegetarian he doesn’t have crackling, the caught edge of a lamb chop, ribbons of salty bacon……to chaw down on. So I have to find other ways, ways other than a handful of crisps on his plate- this will do nicely for those days when I cannot be arsed to roast potatoes or cauliflowers to a crisp. This looks and sounds exactly like a recipe my Mom makes, but we all call it cole slaw. I love it and it keeps in the fridge for weeks, too. Thanks for your riff on the this “slaw”! Yum!! 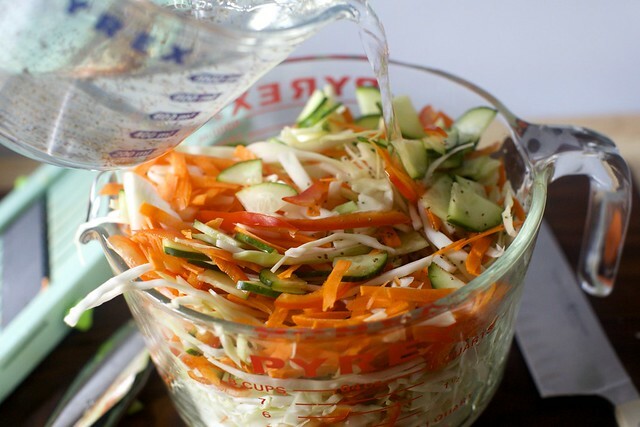 I grew up with vinegar and oil coleslaw with paprika so this is right up my alley!! Well, and pickled anything works pretty well too! This favorite salad is good with seasoned rice vinegar and sweetens enough to skip the sugar. Celery seeds are a genius addition. This is very similar to my German/Hungarian grandmother’s “Freezer Spiced Cabbage”. There is a teaspoon of dry mustard in it as well. The dressing is boiled, and cooled before mixing into the veg. Then chill in the refrigerator and freeze it. It keeps a long time. And the cabbage is crunchy even after thawing. J’Marinde — No need to boil the brine. Brussels sprouts might pickle well, but I’ve never tried to pickle romaine leaves or walnuts. Garlic and dill could be added if you wish. I love pickled slaw! I make it and love it even more than the mayo version. I love the addition of cucumbers! and deb, i’ve said this before (and i’ll keep saying it!) the mediterranean pepper salad is one of my most favorite things, certainly my most favorite salad. always get a little fangirl “ooh, they mentioned The Salad!” …i mean, what is wrong with me? anyway, cole slaw, yes. will add to my list. i love making slaws, and every time i make them the boyfriend says the same thing. “i can’t tell if i love this or hate this.” and then he pushes it around his plate even though i know he likes it but the man won’t eat a vegetable outside of corn or iceberg lettuce. it’s terrible. and forget about fruits all together. i really don’t know how he’s alive, to be honest. oh well, more for me. Looks delicious! I love making mayo-free slaws because they last so much longer. Thanks for sharing! This was made by my German grandparents with the addition of mustard seed. They used a lot more sugar, but I have scaled down the sugar quite a bit. Yummy! 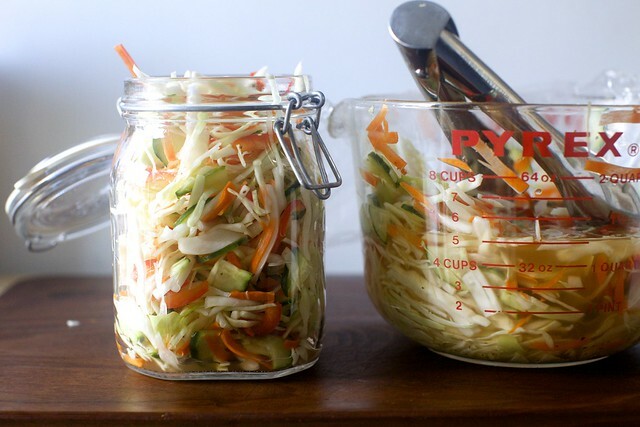 Thanks so much for updating your pickled slaw! It is my favorite slaw recipe and an absolutely required when making any sort of pulled pork. Just a couple of hints for those who haven’t made it and have missing out on the best slaw in the world: Using all purple cabbage makes everything this odd bright purple, so stick to green (I’ve made that mistake); adding a bit of onion makes it divine (and very similar in taste to KFC only with vinegar instead of mayo–a plus); and substituting a regular garden cucumber means mush on day 7–use a kirby like Deb suggests. Thank you as always, Deb! This would be a nice side for a turkey sandwich. Especially healthy after the richness of Thanksgiving food. I’ve pickled Brussels sprouts and also made sauerkraut with them. I was pleased with them both. A mixture of freshly roasted Brussels sprouts and chopped sauerkraut ones was an interesting side. can this “pickled cabbage salad” be made without salt? I love pickled foods but need to stay away from salt…..do you have a solution for us? This sounds really yummy. Thanks for sharing this recipe. I love pickling green tomatoes, cabbage, carrots and peppers! I usually leave mine sealed for a month and it’s mouth watering!! I was just over on Food52 and they mentioned your brought “Pizza Beans” to a potluck with Dana Cowin. It sounds perfect for winter! Any chance it’s up next or is it being saved for the new book? This reminds me so much of something my Gran made. I loved it. Looks delish! Add 1/2 T of crushed red pepper flakes. Pickling and Kosher salt have no added ingredients like anti-caking or iodine, which might produce off-colors or flavors in your pickle. The main difference between the two is the size of the crystals. Kosher salt has bigger, flaky crystals, and weighs less per volume than the smaller crystals in pickling salt. Sea salt and flavored salt crystals can also vary in size, and have additional ingredients that could change the flavor or color of your pickles. Best salt to use for consistency: Pickling salt. Sarah, and others wanting to know what an “unhealthy” salad is: my mom would put a leaf of iceberg lettuce on each plate. Whip about 3-4 tablespoons of heavy cream, stir in a spoon of peanut butter, and spoon atop the lettuce. Then add a few slices of banana to decorate. I liked it as it was almost dessert. And we ALWAYS had dessert. Just had a version of this at Fuego (DC suburb) that included jalapeños and cauliflower – addictive but VERY spicy, as the restaurant name might imply … highly recommend! Just made this for a potluck on Friday! It’ll sit and get yummier and I don’t have to worry about day before preparation! YeaHoo! Hi Deb, long time reader of your blog and cookbook and recipe-trier, first time poster. I just was over on Food52 and they mentioned you were at a potluck party for Dana Cowin’s new book (how cool) and brought something awesome called “pizza beans” Can you share it? Can you tell us how fun the party was? Do you think I could replace the sugar with Stevia? 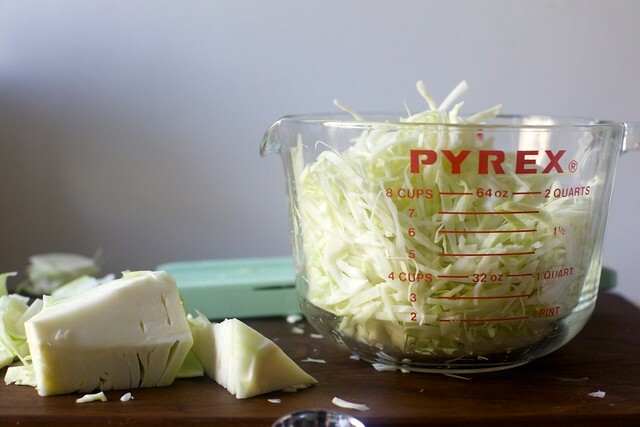 This recipe reminds me of your pickled vegetable sandwich slaw – which we LOVE. Can’t wait to try this version… looks even quicker/easier since there’s no boiling/cooling of the brine required. And I’m drooling over some of the variations in the comments; I’m adding Brussels sprouts and cauliflower to the list right now! Kim — It is. That one is a little bit saltier (these cabbage salads are usually more sweet) and it uses mustard seeds and different flavors… but very similar. stephanie — Thanks, now fixed. I’ve been looking for a recipe like this. Thank you. I’m going to a dinner party and I was asked to bring a cabbage salad. Sorted! I’m going to try it with some cauliflower. And I think adding some halved garlic for a day or two would give it a little hit of hot. I do love curtido, so I’ll have to try this. I am intrigued by the idea of adding cauliflower, which some other commenters mentioned. Love how creative the responses are here! You can really add anything to pickled cabbage to make it your own. So glad pickled things are still cool. Something very like this has been around for literally hundreds of years. In medieval times, however, it often made in layers (adding more vegetables to the crock as they were picked) and was called (at least in some places) compost. This was, of course, long before “compost” came to mean layered no-longer-edible vegetables. my mother made this many years ago. she called it “forever cole slaw And like you she put hers in a nice clear glass dish. we always made it at Thanksgiving and then served it again at Christmas when the flavors had had a chance to blend. one year my son was tasked with getting it from the fridge to the table.. thereafter we refer to the incident as the year KEVIN DROPPED THE COLE SLAW. I know you will understand that my eyes did shed a tear or ten when I saw all that yumminess hit the ground. Mmm, celery seed. That’s the semi-secret ingredient to my mom’s cole slaw. Celery seed and a mayonnaise dressing. I’ll have to try this to see how it’s different. As mentioned by someone, this is very similar to Haitian “pikliz”. While traditional pikliz has an alarmingly number of Scotch Bonnet/habanero peppers per jar, you can start with this recipe and add just a hint of heat by slicing a jalapeno pepper in half and incorporating it. I always try to invert the jar holding this once or twice a day to get the pepper flavor to blend throughout. Adjust the number of peppers to suit your taste, if you like the heat but it’s too much, try half a pepper; or add more if it’s not enough. This is pretty similar to a side dish called achar in Peranakan (Straits Chinese) cuisine! Apart from cucumbers and carrots, we also use pineapple chunks, and long beans and pickle them in a spicy pickle that consists of shallots, red chillies, candlenuts, tumeric powder and some water all blended together and fried before adding the vinegar. Then we add some chopped roasted peanuts and sesame seeds for crunch and keep it in the fridge to have with all the meals we can have it with. How about throwing in some dried cranberries and toasted pine nuts just before serving? Sweet and sour – rather yummy. I make a Pennsylvania Dutch salad called pepper cabbage that is similar to this – although it’s less of a brine and more of dressing with some oil in it. It can be frozen with great success – SO CONVENIENT when cabbages are enormous right now and dirt cheap. I serve it as a salad, sandwich additive, or side dish to anything. Do I drain the brine before storing or does it store in the brine? Erica — You can do it either way. It will probably keep longer in the brine, but no need to serve it in a puddle of the liquid. So good that I am making another batch tonight! What mandolin do you use? I need it for my Xmas list! We used savoy and also added a yellow wax pepper. Excellent side with noodle beef stir-fry and I can’t wait to toss it on a sandwich. I used a inexpensive Oxy mandolin for the carrot and kirby cucumber’s I found at our weekly farmer’s market. The brine sounds wonderful! Cabbage salads are my favorite. Sweet and crunchy, and hold so well in the dressing for several days. Perfect for weekday lunches! This was amazing (I’m not crazy about bell peppers usually, so I left them out–still good!). I may find myself making it weekly. Husband loved it, daughter loved it and even ate it when I put it in her lunch–all-around win. We’re having it tonight with hot dogs & leftover crash hot potatoes. Yes, as ZK says this is a very popular salad in Hungary known as csalamade salata. In my child’s level Hungarian I have always interpreted this as “family salad” (csalad) because there’s a specialize version depending on which restaurant or family you visit. Not for those on a low sodium diet, I’m sure, but do you know the approximate amount of sodium that lives on in the salad after pickling? Barbara — No, I would not be able to find out without a chemistry lab, I fear. However, if you’re looking to reduce the salt, do it proportionally with the sugar, so if less salt, less sugar too. I’m distantly related to Tracey Zabar thru marriage. We’ve been thrown together at a number of family events – Summer BBQs, bar mitzvahs, weddings. She’s a pip, a genuine UWS artifact, and an obsessive baker. If the opportunity to meet her ever presents itself, Deb, make it happen. I think you two might really hit it off. Imagine – unlimited access to ‘health salad’! Tystate — Thanks! It would be a treat to meet her. This. Was. Awesome. Every member of my family liked this (and this is saying a LOT). We had it with some beans cooked with Indian spices, and it was a really tasty counterpoint. Can’t believe I’ve gone so long in my life without this dish. Thank you! Looks absolutely delicious, will have to try! Thank you for this simple, fabulous recipe! We harvested a lot of cabbages from our garden, and I was looking for a non-mayonnaisey salad for them. This fits the bill perfectly! Everyone likes it. Yum – thank you! Found this when looking for a pickled cabbage recipe to go with the no-rotisserie-needed chicken shawarma recipe just published on nytimes. My favorite London shawarma shop was unique in offering pickled cabbage as well as the lettuce/tomato/onion that usually counts as “salad” for British sandwiches. Have been back home in the US for 2 years, and so happy that I will be making shawarma this weekend! I am posting here for the first time. I followed your directions (my cabbage may have been too big) but the brine didnt cover the veggies in my big bowl. Should it be covering them all the time when storing it in the fridge? I did have the glass containers like you show in your pics but the liquid is not all the way up. Would appreciate your help. I think I’ll love this since my Jamaican Jerk chicken shop sells a kind of picked cabbage but this looks close to it. Sal — Yes, I think it was the same for me. I just shook it up/tossed it around whenever I saw it for the first couple days, then it had collapsed enough that it wasn’t an issue. Making this for our blizzard day! The 1.5 pound cabbage I used seems to make a TON of slaw. Hopefully the recipe will still work! Hi Deb – I’m a HUGE fan of your site. I just recently found it and have been working my way through your archives. Quick question about the brine – do you know if you can sub out the sugar for splenda? I’d like to make this for a brunch coming up but mom can’t have sugar. Hi Michelle — I haven’t tried this with a sugar substitute, and it doesn’t look like anyone else that’s commented here has either. But it looks like it can be done. I made this with yellow peppers instead of red and sliced radishes instead of cucumber because they were what I had on hand, and it was delicious. But the best part was the colors after it sat in the fridge overnight. The radishes brightened and bled a lovely pale pink into the brine , making the prettiest yellow, orange, pink and white salad ever! arrgh, WERE the colors. Sorry. Any idea if it’s okay to make/store this in a metal bowl? I don’t have a glass one large enough and I’m worried about ruining the salad with a metallic aftertaste. Sarah — Only reactive metals (aluminum, copper) will be an issue. Most metal mixing bowls these days are stainless steel, which shouldn’t be an issue. Do you think this could be canned in a hot water bath and kept in the pantry until opened? We have an abundance of cabbage this year and I would like to make a dozen quart jars for use through-out the winter. Dori, Steph — I don’t consider myself a canning expert although I cannot find any reason here it wouldn’t be okay to can this, it might be best to cross-check in on a canning forum just to be safe. I love your blog and this “surprise me!” feature is fantastic!! Anyway, I’m living in Haiti for 2016 and this recipe looks a lot like Pikliz, except we add spice to it (in Port-au-Prince, we normally use scotch bonnet peppers). Thanks for sharing this with the world! Could honey be substituted in place of the granulated sugar? If so, how much would you use? OMG…will be putting in the garbage…1 Tablespoon of salt and 2 teaspoons…its horrible and I love salt! I originally found this recipe on NPR’s website and just came across this post here (a blog I’m already well-acquainted with). So happy to learn that the cooking step is not necessary! I have been making this for years. I top each serving with crumbled (deli) feta. Great combination. Have been following you for years and have loved everything I made from SK recipes. I just made this salad, and, wow!! Majorly delicious. Thanks for another great recipe! how the heck am I supposed to know what “brine ingredients” are? The first section of the ingredients is labelled Brine. I didn’t have white vinegar (living abroad and haven’t tracked down where to find it yet), so used a mishmash of white and red wine vinegars and apple cider vinegar. If I had it all to do again, I would cut back on the sugar. I suspect that the varieties of vinegar I used made for a sweeter finished product. But it was still good. Someone asked me where I got the recipe, and thought it must be an old family recipe. The cabbage is best fermented i.e. without any vinegar or water in a natural way. That’s the Russian way of making and storing it. Perfect! This is very similar to the slaw at Pickle Barrel in the Toronto area. I’ve been trying to replicate it for years. The celery seed is key. I also used the brine in a jar of thinly sliced red onions. Mmmmm!